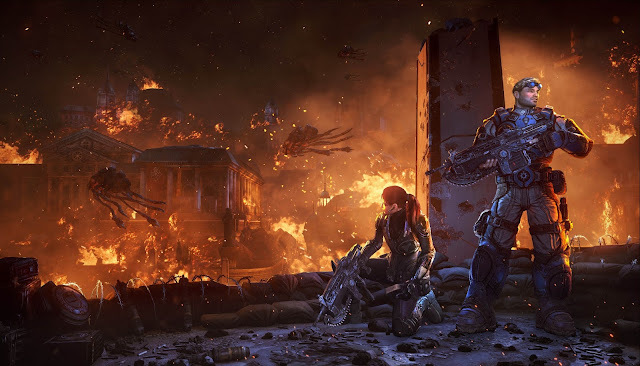 Gears of Halo - Video game reviews, news and cosplay : The Gears of War: Judgement reviews are in. Is it good? The Gears of War: Judgement reviews are in. Is it good? "The success of Judgment’s story comes down to the clever use of familiar storytelling techniques. It begins at the end, with Kilo Squad under arrest and facing a military tribunal for an unspecified crime. Discovering the how and why they arrived here is exciting because you’re involved in every moment leading up to the arrest. Cutscenes are mercifully few and far between, leaving us to dig into the details during playable flashback sequences. This is where Gears of War bottles lightning again. Kilo’s testimonies do a terrific job of involving us in a story that unfolds simultaneously with gameplay. Characters observe and comment on their environment in the moment, while sporadic narration explains the motivation for their inevitable crime. The Gears of War fiction desperately needed clarity to compensate for its depth, and Judgment gives thoughtful consideration to its audience. The constant context kept me interested, aware, and engaged every step of the way. For the first time, a Gears of War story is as important as its third-person action." "If we look at the narrative, Judgment tried to do something curious. The testimonies are broken down to smaller levels, most of which give the player the opportunity to tell the "declassified" version of what really went down. So, you can either choose to play the level vanilla, or you can choose to play it with special circumstances. Think stuff like, finish the level in X minutes, only use certain weapons, fight even more vicious enemies. In their ideal form, these declassified missions present an opportunity for the player to add some spice to the basic Gears of War setup of shooting enemies with your lancer until they stop moving. It's a shame, then, that half the time it felt like some of the challenges addedannoyances instead of making things more compelling. I loved missions that would force me to get out of my comfort zone, like going through a level pistols-only, or adding an ambush where there previously was none. And then there were levels that experimented with visual obfuscation. One level in particular I can only describe as running through fun house mirrors at a carnival while high. When levels like that came up, I'd pass on going declassified, even if it cost me "stars." See, you're graded on your performance, filling up a three-star bar depending on what you do. Declassified missions fill the bar up faster, though in these cases, it wasn't worth it." "Most of the enemies are guys that you've seen before, from bloodmounts to lambent versions of various creatures, and you'll fight them with the same basic arsenal. There are a few new weapons, like the Marksa, a semi-automatic rifle with a good scope that makes for a lighter, friendlier gun in medium-range sniping situations. The biggest gameplay change is a control change that makes weapon-switching more like Halo or Call of Duty. Instead of using the D-pad to switch between four different weapons, you can now hold two, and tapping the Y button swaps between them. Grenades are now dedicated to the left bumper, rather than being something you have to select before you can use. This change may come down to personal preference, but playing Gears this way makes me wish it was like this all along. Grenades become a lot more useful when you can just toss one out at will instead of having to stop shooting just to switch over to your grenades. It's a nice change that some people will probably hate." Game Informer wussed out, sighting some problem with Sim City. Hello! There's an epic campaign to be played. Just review that!